Israeli soldiers abducted, overnight until morning hours Tuesday, at least twenty-eight Palestinians, from their homes in several parts of the occupied West Bank, the Palestinian Prisoners’ Society (PPS) has reported. The soldiers invaded and ransacked dozens of homes across the West Bank, and interrogated many Palestinians while inspecting their ID cards. In addition, the army installed many roadblocks in several parts of the West Bank, before stopping and searching dozens of cars, and interrogated many Palestinians. The PPS office in Nablus governorate, in northern West Bank, said the soldiers abducted Malek Bilal Eshteyya, Moath Bilal Eshteyya, Mahmoud Saqer ‘Aseeda, Majd Jalal Eshteyya, Mahmoud Mustafa ‘Aseeda, Qoteiba Mohammad ‘Aseeda, Jamal Ayyoub ‘Aseeda, Bara’ Issam Reehan, Omar Emad Reehan, Yasser Jalal Yameen, and Abdul-Rahman Mohammad Shahad. In Tulkarem governorate, in northern West Bank, the soldiers abducted Bassel Rida Mer’ey, Emad Mohammad Asba and Mo’taz Sidqi Ekbariyya. In Qalqilia governorate, also in northern West Bank, the soldiers abducted Emad Ghaleb Abu Haniyya. In Jenin governorate, in northern West Bank, the soldiers abducted Lutfi Khallouf. In Tubas, in northeastern West Bank, the soldiers abducted four siblings, identified as Ahmad Radwan Daraghma, and his brothers Mohammad, Mahmoud and Yacoub. 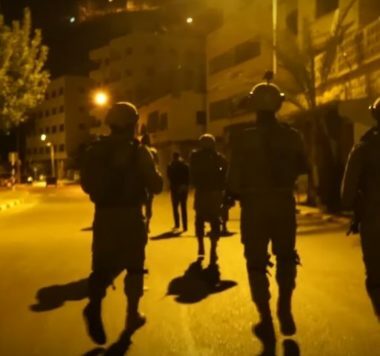 In Ramallah governorate, in central West Bank, the soldiers abducted Mahmoud Sa’id Shreiteh, Fayez Samir Tirawi, Amer Tirawi, Zidan Adnan Khattab and Islam Wajeeh Hassanein. In Bethlehem, south of occupied Jerusalem in the West Bank, the soldiers abducted Hani Saifi. In Hebron, in southern West Bank, the soldiers abducted Mahmoud Mohammad Amro and Samer Ahmad Matar, and stole gold and cash from Matar’s home, while searching and ransacking it.